The CD-1 Pro Ignition is accepted for use in Sportsmen Classes in NHRA for competition (refer to acceptance letter from NHRA). The CD-1 Pro version has all the same features as the standard CD-1, except that data logging is disabled as required by NHRA. A distinctive clear anodized housing allows easy identification of the CD-1 Pro version. The PC Link CD Pro software used with this version has all the same features as the standard PC Link CD software, except that data logging setup selections have been deleted. The standard PC Link CD software cannot communicate with the CD-1 Pro version. 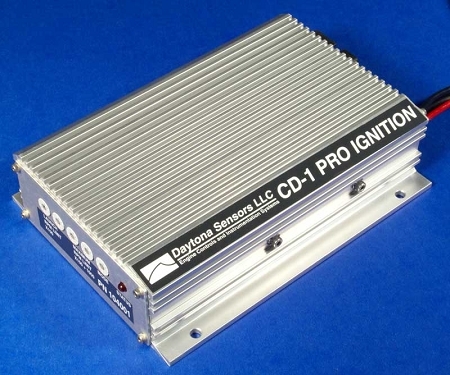 · Complete capacitive discharge ignition system for 4-6-8 cylinder race engines. · 135 mJ spark energy output. · Digitally set launch, burnout, and maximum RPM limits with 100 RPM steps from 3,000 to 9,900 RPM (10,900 RPM for maximum RPM limit). · PC programmable advance features ranging from a simple RPM based advance curve to a 3D timing map with boost proportional retard. · Dedicated input terminals for launch RPM and manifold pressure. · One general purpose input and two general purpose input/output terminals. Inputs can be programmed for high gear retard, burnout RPM limit, vehicle speed sensor, and throttle position sensor. · Outputs can be programmed for RPM window switch, nitrous system activation, and multi-gear shift light functions. · Fully encapsulated construction using surface mount electronics. Waterproof and highly resistant to vibration and shock. 12 pin Deutsch connector used for signal connections. · Highly efficient switching power supply based on US Patents 6518733 and 6636021. Less than 5 amp current draw at 8,000 RPM. Rated for continuous operation at 8,500 RPM and 85º C (185º F).